Although formulation is a closely held secret it is hard to ignore the terpene craze since I come from “Ocean Grown” San Diego. I find the best way to architect flavor for CBD or any Medical Marijuana product is to follow Deborah Dolen’s approach; first to examine the chemical break down of the product desired to be flavored. I look for the specific composition of the cannabinoids or terpenes already present in each particular strain. Marijuana and Hemp strains vary widely as to their own predominate organoleptics (taste and smell properties.) They can posses over 120 terpenes that play a large role in the existing flavor and aromatics of the plant [substrate,] but often are notably high in just a few. Luckily I have all of the primary constituents and terpenes mentioned below in my flavor laboratory. We use them to create flavor and basically use all them when creating our “Mary Jane” terpene profile Flavor. 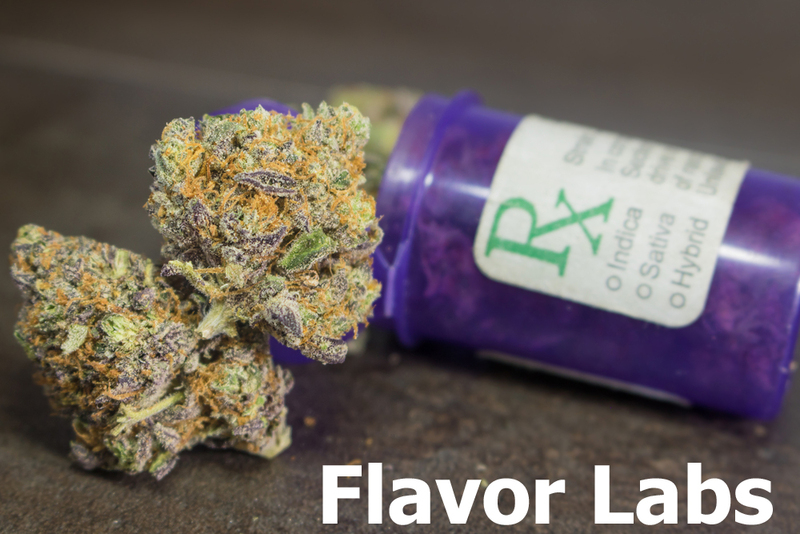 Flavor Laboratories, Inc. Our very potent concentrates designed specifically for wax and terpene flavoring can be found here: wax-oil-flavoring.com Below will guide you to compare your profiles and help you determine what would be the optimal flavor for your base product! For example Kush and Lemon Kush are both very high in Limonene and Citral. This would lend these two strains to a Citrus type flavor profile such as Lemon Drops, Lime, Margarita, Skitals (which is a grape lime combination,) Strawberry Lemonade, and/or anything Orange, Tangerine or even Grapefruit. Hawaii 5-0 flavor would be another good example of where Kush or Lemon Kush could be directed or any punch type flavor. Kush and/or Lemon Kush could really be fantastic if blended with the Pineapple Express strain at say a 1:1 ratio. Pineapple Express is high is Myrcene which lends itself wonderfully to Mango, Apple, even Banana, as well as Pineapple and/or Coconut flavor notes. [The mango fruit naturally has Myrcene.] Meaning a nice symphony of flavor could be achieved with a Kush/Pineapple Express blend and enhanced with any tropical or punch type flavors. Chocolate may be interesting against any citrus type flavor profile or even vanilla which is your “cream” note typically. So “Orangesickle” could work well with either or both of these strains–which is typically a blend of orange and vanilla flavor notes. True Blueberry strain is high in Linalool [think Lavender] and would pare well into a Fruit Loops type flavor because Fruit Loops is high in Lavender (I know – who knew?) or go with the obvious flavor enhancement of “blueberry” or even “grape.” Our new and natural Blackberry we are about to announce would also pair well. Trainwreck is most challenging as it is high in Alpha Pinene, a very intense camphor note with only a touch of herbal lift and/or tropical nuance. Trainwreck would be best left alone or at best enhanced with a cooling mint flavor profile. It is possible a green tea “Matcha” infusion could work for flavor in Trainwreck. If your substrate is high in Terpineol it would do marvelous with banana or vanilla flavors. This is because Terpineol has some clove notes which are instrumental to a good banana or vanilla flavor. This opinion also extends to any herb high in βeta–Caryophyllene. βeta–Caryophyllene is a warm, spicy sesquiterpene found in many plants. Clove and Black pepper to name a few. It’s deep, spicey and rich odor and flavor can take Banana, Chocolate, or even Vanilla in a realistic and tasty direction. If your substrate is high in Alpha Bisabolol your in luck because this can go in many flavor enhancement directions as it is high in floral notes which surprisingly what really attracts us to a good “raspberry,” “strawberry” or any berry note. The therapeutic values of working with existing terpenes and enhancing with additional flavoring is where the fun begins and unexpected benefits can flourish. Although creating a pleasurable flavor experience is my only goal and avoiding claims of “efficacy” my second goal – I rarely delve into what health benefits may be experienced. When trying to design a specific effect it is important to pay attention to what compounds could modulate others. You need to consider your entire composition as a “whole.” Some compounds can negate or “override” benefits of other compounds. According to Leafly and Steep Hill Halent Linalool helps with insomnia, anxiety, pain, and epilepsy. Myrcene can be helpful for sedation, inflammation, pain, and spasms. Most importantly Myrcene can potentially reduce resistance across the blood-brain barrier which facilitates access of other chemicals. Myrcene also enhances effect of THC if present. Limonene is purportedly good for gastric issues, anxiety and depression. Pinene (or α-pinene) helps with asthma (in the way that it acts as a bronchodilator) and inflammation, such as inflammation of the lung walls and Pinene is said to promote focus as well as alertness. Since Pinene is found in what I call the “Italian herbs” and even orange peels-I suspect it acts as a superior anti-viral. Strains high in include: α-pinene Jack Herer, Dutch Treat, Indica, Skunk and Strawberry Cough. 12 Apr	This entry was published on April 12, 2018 at 3:46 pm. It’s filed under terpenes, wax flavor and tagged terpene flavoring, terpenes, wax flavoring. Bookmark the permalink. Follow any comments here with the RSS feed for this post.